Tickets to the platforms on the north and south of the center platform, designated as A and B, do not admit to the Capitol Building.Tickets admitting to platform A must be presented at the entrances thereto on the north (near the Senate wing). Tickets admitting to platform B must be presented at the entrances thereto on the south (near the House wing).Cards of AdmissionThe capacity of the galleries is limited, therefore it will be impossible to allot more than two cards of admission to each Senator and Senator-elect, or more than one to each Representative, Delegate, and Resident Commissioner of the House of Representatives. Cards of admission to the Senate Floor (except those for Members-elect) will be good only at the bronze door (at the head of the steps on the east front of the Senate wing) and at the door beneath the arch under these steps.Cards of admission to the East Galleries will be good only at the bronze door (at the head of the steps on the east front of the Senate wing) and at the door beneath the arch under these steps. Cards of admission to the West Galleries will be good only at the north door of the Senate wing.All cards to the galleries and to the floor of the Senate Chamber will also entitle the holders to seats on the inaugural platform.The two eastern doors and the north door of the Senate wing, as above described, will be open at 10 o’clock am to those holding cards of admission. Persons presenting themselves at any other entrance will be refused admission.Entrance to the Senate GalleriesThe section of the Gallery known as the Senate Reserved Gallery, on the eastern side, between the Ladies’ Gallery and the northeastern Reserved Gallery, will be set apart for guests of the President, the Vice President, the President of the Senate pro tempore, the Speaker of the House of Representatives, the Supreme Court, Members of the Cabinet, and Senators. Special cards will be issued for this Gallery, and no one will be admitted without such card. The Diplomatic Gallery will be reserved exclusively for the families of members of the Diplomatic Corps, and cards thereto will be distributed by the Secretary of State. The Press Gallery will be reserved exlcusively for the correspondents of the press. Cards thereto will be countersigned by the Chairman of the Press Committee, and will entitle the holders to proceed to the place reserved for them on the platform while the procession is forming and prior thereto.The Northeast Reserved Gallery and the Ladies’ Gallery will be reserved for the guests of Senators. The three West Galleries will be reserved for the guests of Representatives; and the cards will be distributed by the Representatives who are members of the Committee on Arrangements, to whom Representatives, Delegates, and Resident Commissioners should apply on or before March 1.Entrance to the Floor of the Senate ChamberThe doors of the Senate Chamber will be opened at 11 o’clock am to those entitled to seats on the floor of the Senate. The Sergeant at Arms of the House of Representatives will distribute cards of identification to Members-elect, who are requested to accompany the Representatives of the Sixty-fourth Congress and enter the Senate Chamber at the south door.The Secretary of State will distribute cards of admission to the Senate Chamber to the Ambassadors and Ministers of foreign countries, and they are requested to enter at the Senate bronze door and to assemble in the Marble Room from whence they will be escorted to the floor of the Senate and announced. The Sergeant at Arms of the Senate will distribute cards of admission to all others entitled to the floor of the Senate, and they are requested to enter at the Senate bronze door or the door beneath the arch under the bronze door.Those entitled to admission to the floor of the Senate will be shown to their seats upon entering the Senate Chamber.The Supreme Court, preceded by its officers, will enter the Senate Chamber at 11.45 am and be announced.Retiring Members and Members-elect, preceded by the officers of the House of Representatives, will enter the Senate Chamber in a body at 11.50 am and be announced. The Procession to the Inaugural PlatformAfter the conclusion of the organization of the Senate, those assembled in the Senate Chamber will proceed through the Rotunda to the platform on the center portico of the Capitol in the following order, viz:The Sergeant at Arms of the Senate and the Sergeant at Arms of the House of Representatives. The Marshal and the Clerk of the Supreme Court. The Chief Justice, Associate Justices, and Reporter of the Supreme Court. The President and the Chairman of the Committee on Arrangements. Amabassadors to the United States. Ministers Plenipotentiary to the United States. The Vice President and the Secretary of the Senate. The Senate of the United States and Ex-Senators. The Speaker and the Clerk of the House of Representatives. Retiring Members, Members-elect, and officers of the House of Representatives. The Members of the Cabinet. Governors of States and Territories. The ranking Admiral of the Navy and his aide. The Chief of Staff of the Army and his aide. Officers of the Army and Navy who, by name, have received the thanks of Congress. All other persons who have been admitted to the floor of the Senate Chamber, followed by those who have been admitted to the galleries. Order of Procession from the GalleriesThe occupants of the galleries will be escorted by officers in charge to the platform in the following order:Those occupying the Diplomatic Gallery and the galleries to the east therof will proceed down the east stairway to the south side of the Senate Chamber, the line halting at the east side of the south door. Those occupying galleries west of the Diplomatic Gallery will proceed down the west stairway to the south side of the Senate Chamber, the line halting at the west side of the south door. When the rear of the procession from the Senate floor shall have passed, those on the east of the south door will follow, and, when they shall have passed, those on the west side of said door will follow.While the Senators-elect are being sworn in and the procession formed, the correspondents of the press will proceed in a body down the west steps leading from the gallery, through the Rotunda, to the seats reserved for them on the platform. Proceedings on the Inaugural PlatformOn reaching the platform the President will occupy the seat reserved for him, the Chief Justice on his right and the Committee on Arrangements with the Sergeant at Arms of the Senate on his left. Ex-Presidents, ex-Vice Presidents, Associate Justices of the Supreme Court, the Vice President, the Secretary of the Senate, Senators and ex-Senators will occupy seats on the right. Retiring Members of the House and Members-elect will be seated on the right next to and behind the Senate.The Diplomatic Corps will occupy the seats on the right of the President. Governors of States and Territories, Members of the Cabinet, the ranking Admiral of the Navy, the Chief of Staff of the Army, and the officers of the Army and Navy who, by name, have received the thanks of Congress, will occupy seats on the left. Such other persons as are included in the preceding arrangments will then be seated.When all are assembled, the oath of office will be administered to the President by the Chief Justice.The President will then deliver his Inaugural Address. Upon the conclusion of the Address the Members of the Senate, preceded by the Sergeant at Arms, the President of the Senate pro tempore and the Secretary, will return to the Senate Chamber. The President and the Vice President, accompanied by the Committee on Arrangements, will proceed to the White House.Regulations for the Senate WingAll doors of the Rotunda will be closed and passageways leading thereto will be kept clear. No person will be permitted to pass from the House wing through the Rotunda except Members, Members-elect, and the officers of the House of Representatives. All entrances to the Senate wing (except the three heretofore mentioned) will be closed on the night of March 4 and kept closed until after the inaugural ceremonies. All persons having the right of admission will be admitted only at the Senate bronze door, the door beneath the arch under the bronze door, and the north door. The Sergeant at Arms of the Senate is charged with the execution of these arrangements. William Brown McKinley,Committee on Arrangements. 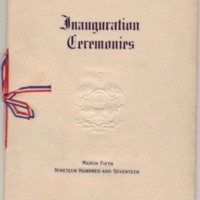 Committee on Arrangements, “Program of the Ceremonies Attending the Inauguration of the President and Vice President of the United States,” 1917 March 5, WWP19587, Eleanor Wilson McAdoo Collection at the University of California-Santa Barbara, Woodrow Wilson Presidential Library & Museum, Staunton, Virginia.